Draft: 2000, Kansas City Royals, 31st rd. January 29, 2018 1B Ruben Gotay assigned to Puerto Rico. January 4, 2018 2B Ruben Gotay assigned to Criollos de Caguas. January 27, 2017 1B Ruben Gotay assigned to Puerto Rico. January 1, 2017 2B Ruben Gotay assigned to Criollos de Caguas from Tiburones de Aguadilla. April 7, 2016 Saraperos de Saltillo released 2B Ruben Gotay. April 1, 2016 2B Ruben Gotay assigned to Saraperos de Saltillo. October 29, 2015 2B Ruben Gotay assigned to Indios de Mayaguez. April 16, 2015 Saraperos de Saltillo released 2B Ruben Gotay. April 3, 2015 Saraperos de Saltillo signed free agent 2B Ruben Gotay. January 30, 2015 2B Ruben Gotay assigned to Puerto Rico. January 1, 2015 2B Ruben Gotay assigned to Cangrejeros de Santurce. October 30, 2014 2B Ruben Gotay assigned to Senadores de San Juan. October 30, 2014 2B Ruben Gotay roster status changed by Senadores de San Juan. March 28, 2014 2B Ruben Gotay assigned to Louisville Bats. January 19, 2014 3B Ruben Gotay assigned to Indios de Mayaguez. 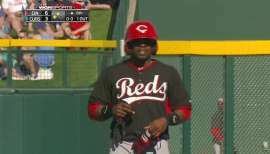 December 18, 2013 Cincinnati Reds signed free agent 3B Ruben Gotay to a minor league contract. November 4, 2013 3B Ruben Gotay elected free agency. November 1, 2013 3B Ruben Gotay assigned to Gigantes de Carolina. April 1, 2013 3B Ruben Gotay assigned to Springfield Cardinals. March 31, 2013 St. Louis Cardinals signed free agent 2B Ruben Gotay to a minor league contract. November 8, 2012 1B Ruben Gotay assigned to Atenienses de Manati. November 2, 2012 2B Ruben Gotay elected free agency. September 1, 2012 Gwinnett Braves activated 2B Ruben Gotay from the 7-day disabled list. August 21, 2012 Gwinnett Braves placed 2B Ruben Gotay on the 7-day disabled list. Sprained left ankle. June 5, 2012 2B Ruben Gotay assigned to Gwinnett Braves from Atlanta Braves. June 4, 2012 Toronto Blue Jays traded 2B Ruben Gotay to Atlanta Braves. April 3, 2012 Ruben Gotay assigned to Las Vegas 51s. March 13, 2012 IF Ruben Gotay assigned to Toronto Blue Jays. November 4, 2011 2B Ruben Gotay assigned to Indios de Mayaguez. November 2, 2011 IF Ruben Gotay elected free agency. June 19, 2011 IF Ruben Gotay assigned to Gwinnett Braves. June 18, 2011 Atlanta Braves signed free agent IF Ruben Gotay to a minor league contract. June 16, 2011 New Orleans Zephyrs released 3B Ruben Gotay. December 7, 2010 Florida Marlins invited non-roster 2B Ruben Gotay to spring training. November 22, 2010 New Orleans Zephyrs signed free agent 3B Ruben Gotay. November 11, 2010 Gigantes de Carolina traded RHP Federico Baez, LHP Iden Nazario and 2B Ruben Gotay to Senadores de San Juan for LHP Giovanni Soto and 2B Jeff Dominguez. November 6, 2010 3B Ruben Gotay elected free agency. October 22, 2010 Ruben Gotay assigned to Gigantes de Carolina. April 6, 2010 3B Ruben Gotay assigned to Memphis Redbirds from St. Louis Cardinals. November 30, 2009 St. Louis Cardinals signed free agent 3B Ruben Gotay to a minor league contract and invited him to spring training. November 11, 2009 3B Ruben Gotay assigned to Gigantes de Carolina. November 9, 2009 3B Ruben Gotay elected free agency. September 21, 2009 Reno Aces activated 3B Ruben Gotay from the temporarily inactive list. September 1, 2009 Reno Aces placed 3B Ruben Gotay on the temporarily inactive list.